You can use the AWS IoT MQTT client to better understand the MQTT messages sent by a device. Devices publish MQTT messages on topics. 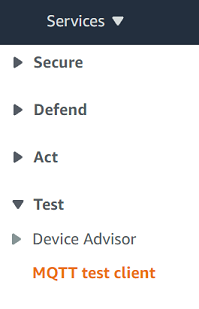 You can use the AWS IoT MQTT client to subscribe to these topics to see these messages. Subscribe to the topic on which your IoT thing publishes. Continuing with this example, in Subscribe to a topic, in the Subscription topic field, type my/topic, and then choose Subscribe to topic. Choosing Subscribe to topic above, results in the topic my/topic appearing in the Subscriptions column. 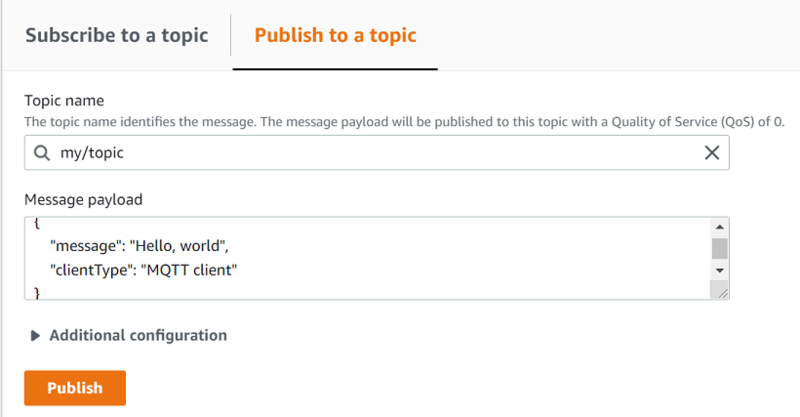 On the MQTT client page, in the Publish section, in the Specify a topic and a message to publish… field, type my/topic. We do not recommend using personally identifiable information in topic names. Choose Publish to topic. You should see the message in the AWS IoT MQTT client (choose my/topic in the Subscription column to see the message).